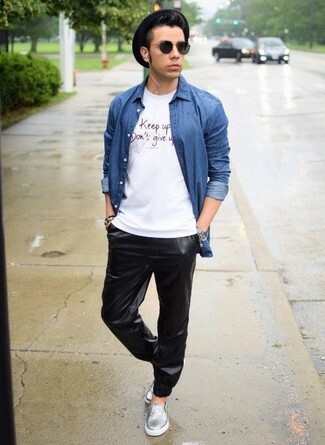 If you're all about relaxed dressing when it comes to fashion, you'll love this on-trend combo of a Saturdays Nyc crosby denim slim fit sport shirt from Nordstrom and black leather sweatpants. Bump up the cool of your ensemble by completing it with silver leather slip-on sneakers. 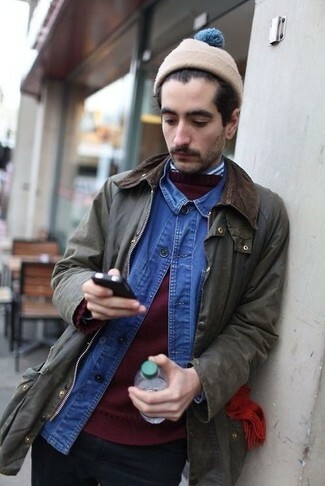 If you're on the hunt for a casual yet stylish ensemble, wear a blue denim shirt with black chinos. Both items are totally comfortable and will look great paired together. 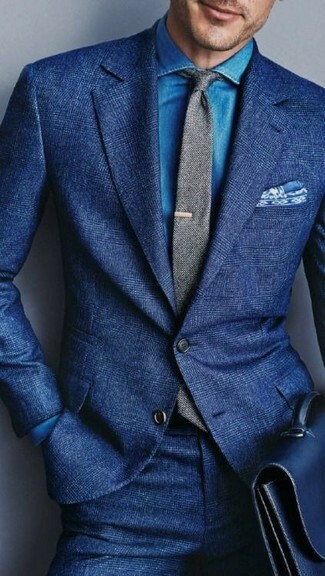 For a nothing less than incredibly stylish ensemble, reach for a blue denim shirt and a blue wool suit. 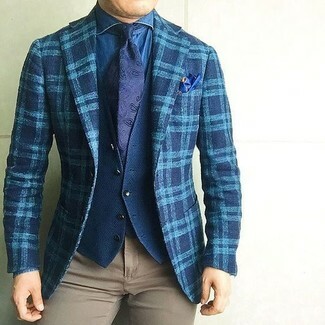 For a smart casual outfit, pair a blue denim shirt with navy and white vertical striped dress pants — these two pieces play nicely together. 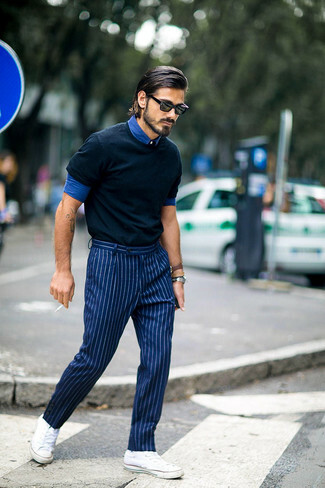 For something more on the daring side to round off this getup, choose a pair of white low top sneakers. 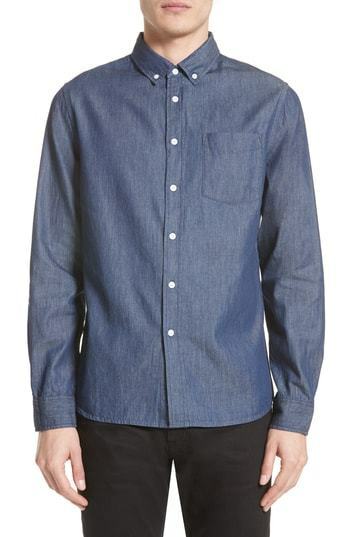 If you're in search of a casual yet dapper outfit, rock a Saturdays Nyc crosby denim slim fit sport shirt with navy jeans. Both items are totally comfortable and will look great together. 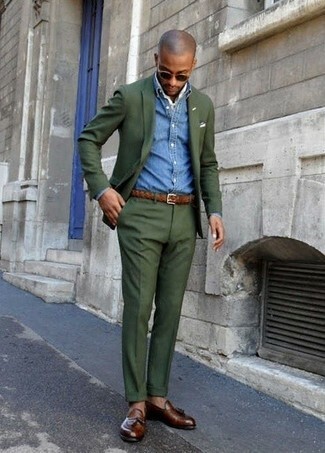 Reach for a blue denim shirt and dark green dress pants for a sharp, fashionable look. 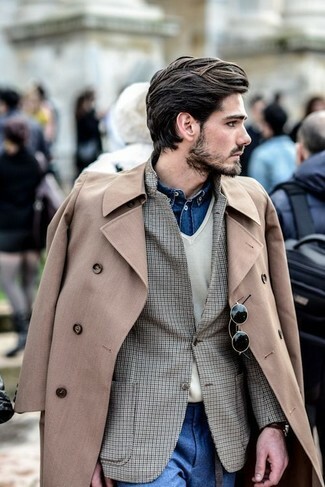 For footwear, opt for a pair of dark brown leather tassel loafers. 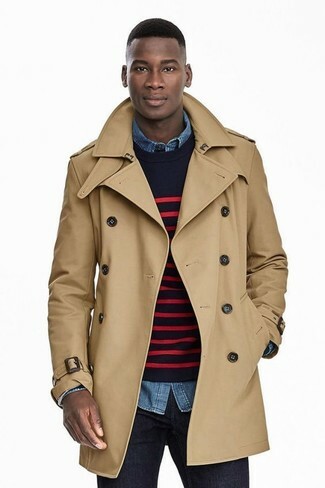 This combination of a Saturdays Nyc crosby denim slim fit sport shirt from Nordstrom and khaki chinos is simple, on-trend and very easy to replicate. If you're a fan of practicality dressing when it comes to your personal style, you'll love this stylish combination of a Saturdays Nyc crosby denim slim fit sport shirt from Nordstrom and navy skinny jeans. 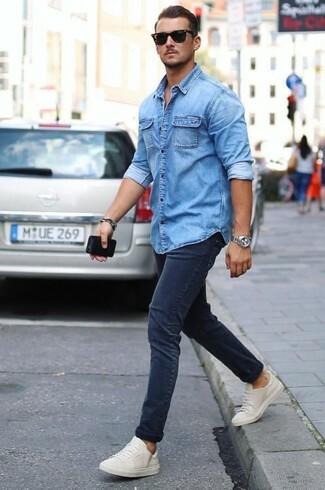 When it comes to shoes, this getup is round off brilliantly with white low top sneakers. Choose a Saturdays Nyc crosby denim slim fit sport shirt from Nordstrom and blue wool dress pants for a sharp classy look.